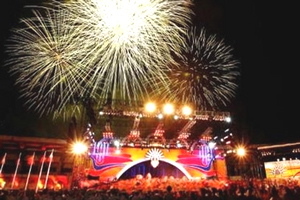 Southeast Asian Games closing ceremonies’ photo by Jove Francisco . The 23rd South East Asian Games , which recently concluded in Manila this week, were known as the South East Asian Peninsular Games until 1975 when the SEAP Games Federation accepted Indonesia and the Philippines as members. The name was then changed to South East Asian Games. Beside the normal sports, there are some unusual games such as Arnis  from the Philippines, Pencak Silat  from Indonesia, Wushu  from China, Muay Thai  (Thai boxing) from Thailand, Sepak Takraw  from Malaysia, dance sport and an underwater swimming where the swimmers wear a huge flipper on their feet. Vietnamese have little interest in the Olympic Games because they don't have much chance of winning a gold medal but we followed the recent SEA Games in the Philippines every day. To Vietnamese athletes, these games are our Olympics and they train specifically for them. In the Philippines, as the hosts’ gold medal count rose, there was controversy when the Thai prime minister supposedly accused the hosts of cheating and poor sportsmanship. The two countries are also sport rivals, particularly in the sport of boxing. The accusations led to much commentary  in Filipino blogs. Torn and Frayed in Manila felt that the Thais were just being sore losers : “‘Pikon’ is a useful Tagalog word meaning something like ‘bad loser.’ There is no direct equivalent in English and I wonder whether there is one in Thai.” Jove Francisco, meanwhile, suggested that the Thai PM was trying to divert attention  from his collapsing domestic popularity. Two years ago, Viet Nam was the host of the 22nd SEA Games and we finished on top of medal ladder. It was one of the most significant events in Vietnamese history, both culturally and in terms of our sporting history. Even though we win lots of medals in a range of sports, football is the king of sports in Viet Nam and the medal we want the most. While the media flooded our papers and TV channels with football mania, lots of ex-pat bloggers had something to say, too. No Star Where, an American in Saigon, blogs about the street fever  and the sad outcome  for Vietnam. Our Man in Hanoi ‘s loyalties are divided between England and Vietnam, Newcastle and Hanoi. 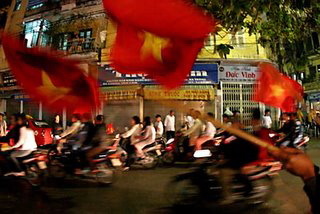 Vietnamese fans ride around shouting “Viet Nam Viet Nam”- “Vietnam Vô Đich”(Vietnam are champions!) or shouting the goalscorers’ names till 1 or 2 am non-stop and it is a great advertising opportunity for businesses, with many companies paying heaps of money to make ads on TV and in magazines to publicise their businesses. Some others conduct quizzes in the newspapers and on mobile phones. Everybody tries to make some profit from the interest in the games, by standing along main roads selling flags, hats, head bands or make up for fans. Photo by Vietnamese God . So, it's over, and again Vietnam lost to Thailand in the football final but we ended up third on the medal table. On to Thailand in 2007!